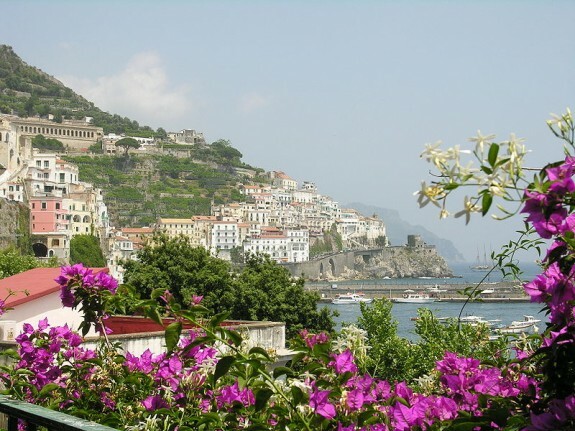 If you love variety and amazing scenery, the Amalfi Coast in Southern Italy has to be the place for you. With Rome as capital city, overflowing with history, and one of the world’s most romantic destinations in Venice, it’s easy to overlook Italy’s wonderfully dramatic coastline. 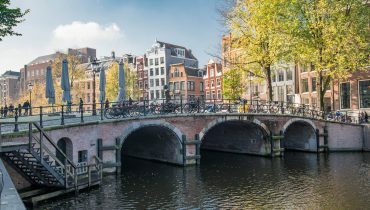 Yet I don’t know of anywhere else that offers, within a few square miles, a crazy cosmopolitan city, a volcano, one of the world’s most beautiful coastal drives, a bay dotted with island retreats, and the fascination of Pompeii. With pasta, pizza and fabulous icecream as your daily diet, how can you go wrong? It’s as scenic as anywhere on the coast and has great transport links by road, rail and water. 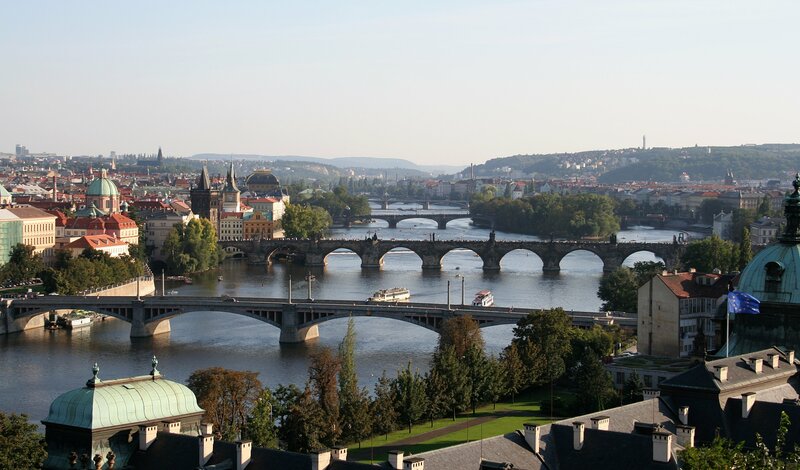 There’s a range of hotels to suit every pocket, and endless dining options. The old quarter is pleasant for evening strolling, and for relaxing after a busy day’s sightseeing. You might need to take your travel sickness pills before boarding the local SITA bus, but you shouldn’t miss this ride that stutters and jerks its way down the coast from Sorrento. Sit on the right of the bus for the most stomache churning views of the 500 foot vertical drop, with the Med glinting far below. I cannot imagine driving this stretch for a living. I would never be able to take my gaze from the view. Nor would I want to be a local in the Summer traffic, unless I had a boat! Still, it’s a truly breathtaking experience, and one of the world’s great bus rides. Don’t make the mistake that I did. The bus stops very conveniently at the top of the village, and you can wend your way down, lingering to browse in the expensive boutiques. Down at beach level you look up again- and up! It is a considerable climb back to the bus stop. An alternative, if you’re not continuing down the coast, is to ferry back to Sorrento. Amalfi is the starting point for a trip up to Ravello. You can’t miss the distinctively patterned 13th century Duomo, but you might also like the Cloisters of Paradise, from which you can gain entrance to Amalfi’s Cathedral. The gelato from harbourside Bar Flavio Gioia is said to be the best in town. 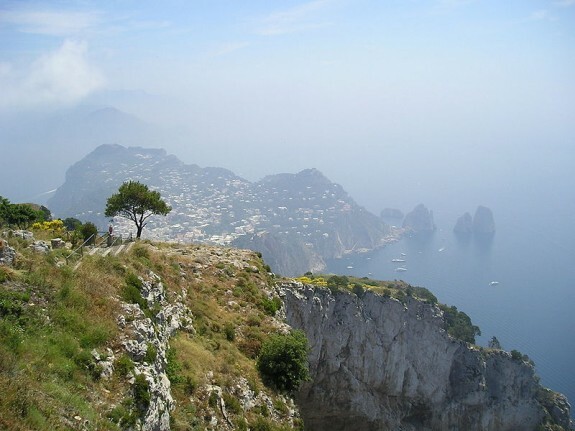 The bus ride to Ravello takes just 30 minutes but once there you’re in a different world. 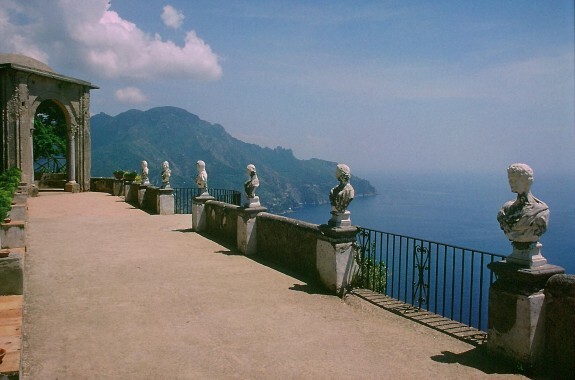 The views from the gardens of Villa Cimbrone, with its “Terrace of the Infinite”, are simply stunning. If you have the time, Ravello is a superb place to join a walking tour, the peace and quiet far removed from the bustle of the coast. If food is more important, the Ristorante della Marra in the 12th century restored Palazzo is a fine choice. Not so well-known as Pompeii and with far fewer visitors, in Italian, “Ercolano” is a good place to get close to the history of the area. 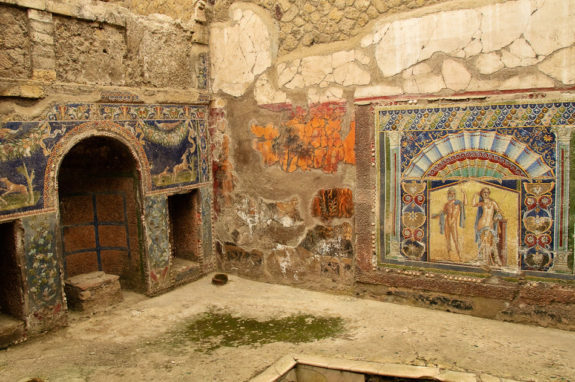 The ruins are very well preserved and it’s possible to see Roman baths and fabulous mosaics. The House of Neptune and Amphitrite (a sea goddess and the wife of Poseidon) has fine examples, while the Villa of the Papyri once luxuriously descended to the sea over 4 terraces. The library of the villa contained many scrolls, now badly carbonised, but with modern technology restoration is only a matter of time. There can’t be a more famous island in all the world than Grace Kelly’s Capri. 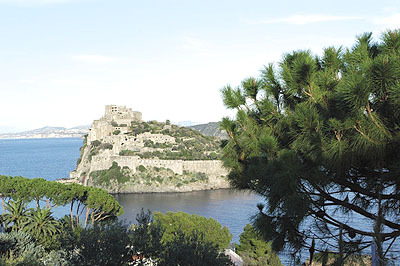 A 40 minute ferry ride from Sorrento brings you in sight of this idyll. From the harbour a funicular travels up to Capri town, or if you’re fit you can climb the steps. Onwards from here you’ll need to catch a bus, up to Anacapri, rattling along through steep narrow streets, your ears popping as you gain height. The brave might like to take the chair lift from here to Monte Solaro. At 589 metres, you can’t get much higher without flying, and the views are awesome. In the foreground the Faraglioni Rocks nestle in the Bay of Naples. Beyond on a clear day you can make out Vesuvius and the island of Ischia. At shore level the tourist trap is the Blue Grotto. The queues for the boat trip can be fearsome in July and August, for just a few minutes spent in the grotto itself. I am assured that sunrise over Capri is a stunning sight, but you have to catch a very early morning ferry out of Naples to witness it. 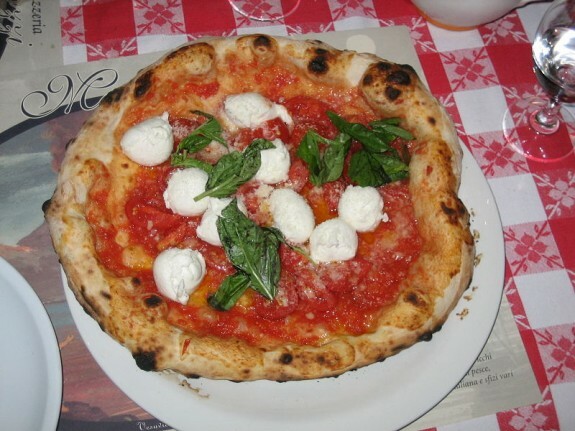 Naples gave birth to the pizza and to the actress, Sophia Loren. The city crackles with life and is hot and noisy in Summer. If you don’t get bowled over by a scooter here, you can survive anywhere in Italy. In small doses it can be quite intriguing, and you should certainly make time for the Archaeological Museum. The best frescoes from Pompeii and Herculaneum reside there, along with the Farnese Collection- impressive statuary excavated in Rome. The waterfront is vast. And the pizza? Originally the food of the poor, the nearest you’ll come to an authentic pizza is at Da Michele on Via Sersale. They only serve 2 types- pizza margherita and pizza marinara, and you have to wait in line for them- no reservations. They’ve been making pizzas since 1870 so I reckon they know what they’re doing. Not an easy option, either in terms of accessibility or physical effort. You need to be reasonably fit and to wear strong shoes as the last section is over rough gravel. The Circumvesuviana Railway runs to both Pompeii and Ercolano (Herculaneum) and from either of these you can catch a bus to Vesuvius. The service is infrequent so you may opt to take a taxi tour from Ercolano station. In any case you will need to walk the last 800 metres up to the rim of the volcano. Worthwhile? Well, it’s not every day you can peer into an active volcano, is it? If you’re more energetic still you can do a 6km walk from San Vitto to the summit, through the national park. It’s possible to look down on Pompeii from the summit of Vesuvius. What a terrifying place it must have been when the volcano decided to errupt. Today it’s a setting that can still give you goosebumps, and one of those rare places where you can almost feel the rumble of chariot wheels. It does repay the effort to get there early and walk to the farthest point before stopping to explore. That way you can escape some of the crowds and let yourself absorb the atmosphere. 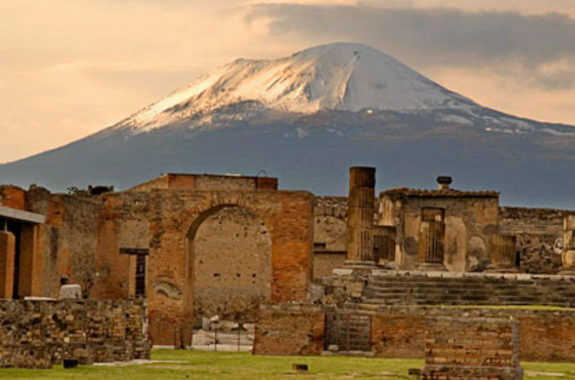 When Vesuvius erupted in 79AD Pompeii was buried in a wall of ash and soot, killing 20,000 people and preserving the city exactly as it stood. It offers a fascinating glimpse into life in those times. 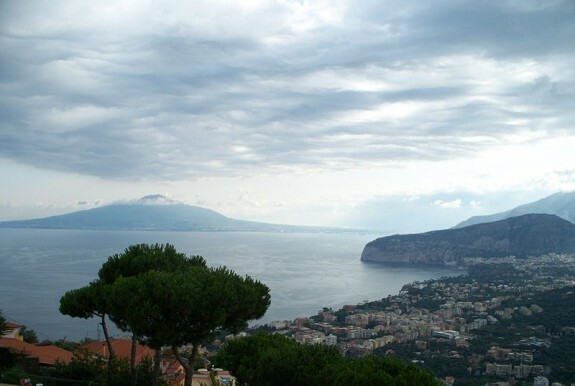 The site is easily reached in 40 minutes from Sorrento on the Circumvesuviana train. Listen to the guides for a few minutes before agreeing to sign up for a tour- some accents are clearer than others. Or you might want to purchase an audio guide and go at your own pace. If you’ve accomplished all the others you will have earned this one! The springs on Ischia have a high mineral content due to its volcanic composition and are believed to be great for curing arthritis and many other ailments. Not only that but it is a very beautiful island, certainly the equal of Capri, though it was swapped for that island by Augustus in 6AD. Hydrofoils leave for Ischia from Naples and some call first at the island of Procida so make sure that you get off at Porto Ischia. The Negombo Park complex has 12 thermal pools and a range of treatments, Mediterranean garden and beach access, and is not far from the port. So there you are. If you can’t fill a fortnight’s stay and have a wonderful time in the process, I’ll be really surprised. 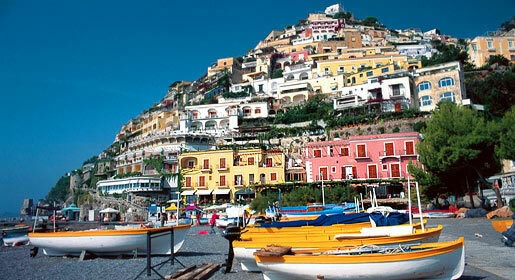 Oh how this makes me want to go back to the Amalfi Coast! 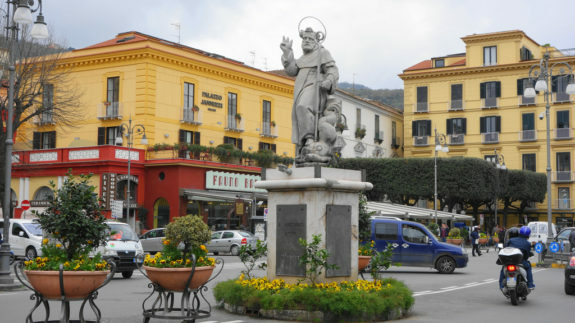 I studied in Sorrento and loved the area. I also recommend Praiano just down from Positano. It’s quiet yet so gorgeous. Love that view of Ravello too!. Thanks Suzy! What a coincidence, you lucky person! Presumably fluent in Italian- do you have Italian ancestry? I would have liked to include Praiano too but I had too many recommendations. I’d love to go back there for a walking holiday to see everything properly. First of alll I would like to say excellent blog! I had a quick question that I’d like to ask if you don’t mind.